Courtesy of Flatbed Cider Co. Asked to consider hard cider’s closest cousin, most drinkers would probably say beer. Both are carbonated. Both have similar alcohol contents. Both tend to be served in 12-ounce packages. From a commercial standpoint the two are tied as well—America’s top cider brand, Angry Orchard, is produced by the Boston Beer Company, makers of Sam Adams. But in many ways, cider’s closest relative is actually wine. Unlike beer, cider is never “brewed”; instead, it’s fermented from fruit juice, like wine. And just as the finest wines come from the best grapes, great ciders stem from great apples. Many of the best ciders on the market today are produced by people with a background in winemaking, farming or both. 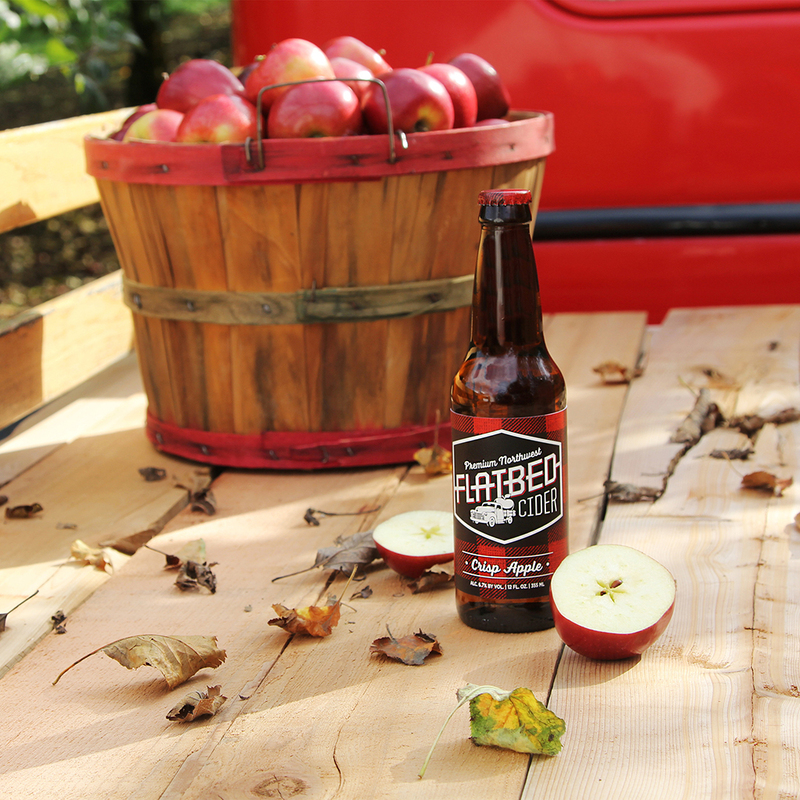 So though Flatbed Cider was launched quietly in January, its potential impact on the industry could be much bigger. The brand is a new endeavor from Chateau Ste. Michelle, easily the largest wine producer in the state of Washington, an interesting distinction since Washington is by far the largest producer of apples in the country. Suddenly, a new player has stepped onto the cider scene: one with a lot of resources, a lot of local apple farms and a major winemaking pedigree. The task of making that cider was handed to Steve Rothwell, a white wine specialist who has been with Chateau Ste. Michelle since 2007. “I expressed the most interest and excitement among the winemaking staff here,” said Rothwell, explaining how the guy who’s also in charge of Chardonnay production for the company’s Columbia Crest brand ended up the resident cidermaker. “I have a wide range of interests amongst alcoholic beverages,” he quipped. In contrast to these lofty goals, however, Flatbed has launched as an extremely small project, nothing more than a large company “dipping our toe in the water,” as they describe it. Production will be modest this year, with numbers in the “thousands of cases” of their two varieties, Crisp Apple and Pear, which will only be available in Washington and Oregon. But if Flatbed does expand, a new intriguing set of issues emerge. With its established national distribution network, Chateau Ste. Michelle would seem positioned to bring Flatbed to a larger audience, but a problem looms: Ironically, the company might not be able to get enough apples. Interestingly, the cider apple issue has some parallels to what Washington went through decades ago with wine grapes. In the 1960s, when the Ste. Michelle brand launched, the state had no real wine industry. As the brand became successful, more Washington farmers began growing grapes and more wineries came to follow in Ste. Michelle’s footsteps. Today, Washington is the second largest wine producing state in the US behind California. But all those vineyards didn’t pop up overnight. They were driven by interest and demand, not just for grapes, but for quality wine grapes. So though it’s far too early to suggest that Flatbed could have the kind of impact on Washington’s apple production that Ste. Michelle had on its vineyard growth, the historical precedent certainly exists. This time around, Ste. Michelle has far more resources than they did five decades ago, and unlike grape growers in the ‘60s, Washington farmers already know quite a bit of about growing apples, even if they aren’t the cider-specific kind. Sure, Flatbed could flop. Cider as a whole could even be passing fad. But if America’s interest in cider continues to gain momentum and evolve, Chateau Ste. Michelle could find itself in a unique and potentially lucrative spot within the industry – one that could have ramifications not just for cider drinkers, but winemakers and Northwest apple growers as well.